Sometimes, people are living successfully in an assisted living community, but concerns over finances arise over time. Other people may prefer just not to live alone. 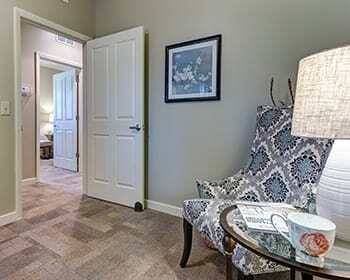 Either way, Maplewood at Chardon has a solution – Lifestyle Suites™, a unique program that allows two residents the opportunity to share an apartment (while still having their own private bedroom), and receive a significant monthly cost savings. Lifestyle Suites™ provides all the benefits of companion living while offering the same full scope of personalized care, luxury services, and unmatched amenities. Lifestyle Suites™ was inspired by our belief that life is most fulfilling when it is shared. The program promotes socialization and helps build rewarding friendships in a supportive environment. According to research, elderly people are more prone to depression and other mental-health challenges if they live on their own. Learn more about this unique program and the rewards it can bring to your daily lifestyle. Lower the cost of a suite, without compromising your privacy. Each apartment includes a private bedroom and bathroom for each resident, a shared common area, and access to all the benefits of living at a Maplewood community. Living with a friend boosts self-esteem and confidence, which fosters an active and engaged lifestyle. Seniors who enjoy companionship are more mentally alert and feel happier day-to-day. Shared living allows seniors to feel engaged with the world around them and alleviates feelings of isolation and loneliness. Maplewood at Chardon carefully assesses personality types and interests, and matches seniors who are best suited to become lifelong friends. Lifestyle Suites™ is a custom program intended to provide premier services and solutions to Maplewood residents and their families. Download our Lifestyle Suites™ PDF. To learn more, contact Maplewood at Chardon.